Jalapeño Popper Pulls - seriously delicious!! Sourdough bread cut and stuffed with cream cheese, jalapeños, bacon, garlic powder and monterey jack cheese. Great for parties!! Can make ahead and refrigerate until ready to bake. Took this to a party and it was gone in a flash! Everyone asked for the recipe. SO good!! This Jalapeño Popper Pull Bread was inspired by two of the most popular recipes on the blog - Cheddar Bacon Ranch Pulls and Cinnamon Roll Pulls. I took all the flavors of a jalapeño popper and put in this pull bread. OMG - heaven. It has a kick from the jalapeños. Feel free to adjust the amount of jalapeños to your personal tastes. We both loved this. It would be great for a party, snack, tailgate or just because. Mix together cream cheese, jalapeño pepper juice and garlic powder. Spread cream cheese mixture in between cuts. Sprinkle diced jalapeño peppers and bacon bits on bread, making sure to get in between cuts. Top bread with cheese, getting in between cuts. Wrap in foil the entire loaf in foil and place on a baking sheet. Bake for 15 minutes. Unwrap (I just open the foil packet to expose the bread). Bake for an additional 10 minutes, or until cheese is melted. You are going to have to quit showing me these!!!!!!!! I can't help myself! This looks absolutely fantastic - you continue to be the appetizer queen. I can't say "yum" enough. I made this today, it was a definate to again. Next time I think ill cut back a bit on the garlic powder and add an additional 5 minutes after opening foil. I made this for a bachelorette party! Was delicious! Took this to a friend's for dinner. It was a big hit. (I subbed 3 strips of (real) bacon for the bits.) Can't wait to make it again. This sounds delish. Definitely will have to try it!!! Thank you for this post! Made it tonight with a few variations: added a tablespoon of blue cheese to the cream cheese, sub turkey bacon and sub picked banana peppers ...very nice! 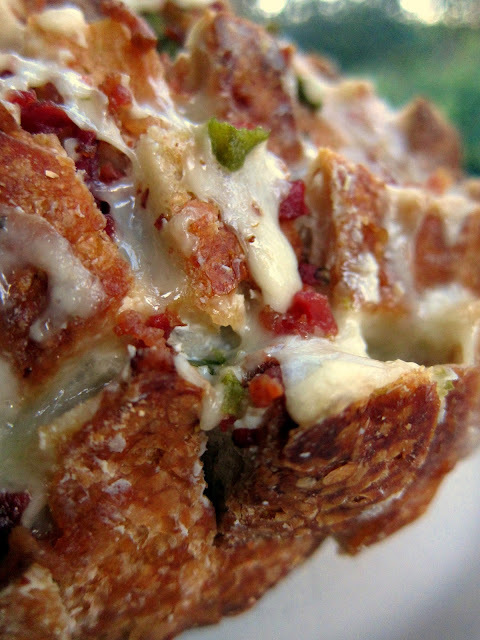 This looks like ooey gooey goodness and I adore all the jalapenos in this bread! I wonder if one could use a plastic bag like a pastry bag to squirt the cream cheese/pepper juice mixture between the cuts instead of spreading it? I bet you could use a ziplock plastic bag and just cut the corner a little. Would make putting the cream cheese mixture into the bread easier. This looks amazing! I love your website. So many yummy things!